Read your Money horoscope 2019! 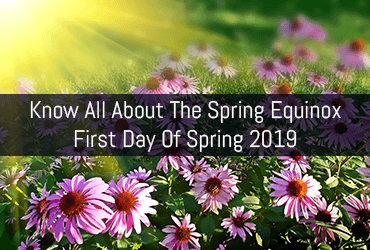 The equinox is celebrated as one full day in many cultures, but the fact is Equinox is technically a particular time in the day when the Sun crosses the equator. What Happens on an Equinox? The Sun makes a transition from the Southern to Northern hemisphere and crosses the celestial equator on one specific day. The term “Celestial equator” is used because it's just an imaginary line above the equator in the sky. Equinoxes happen only twice a year when the Sun rises in the east and sets in the west for the entire Earth. Post the Spring Equinox, the Northern Hemisphere tilts towards the direction of the Sun and hence the days become longer and warmer. There are certain festivals like Passover & Easter which are celebrated in many cultures when the Sun crosses the equator. One of the oldest tradition to celebrate the spring equinox in popular Chinese culture is about balancing the eggs. In most of the cultures, Eggs are considered to be the symbol of new life and fertility. This is probably the reason the Chinese attempt to balance the eggs to receive the blessings of lady luck. It is widely believed that if you can balance the eggs on this auspicious day, then you will be prosperous and lucky throughout the year. Are you on the right path? Read your Career horoscope! Another important tradition which is followed on the day of Spring Equinox is called Hogan in Japanese culture. It is called “The Other Shore,” and the Buddhists in Japan observe it. It basically represents the spirits which attain Nirvana once they cross the river of death and life. It basically describes the transition of these mortal souls from the state of sufferings to ultimate enlightenment. How to celebrate the Spring Equinox? Move out in nature and enjoy various activities like a bike ride, walking, watching the sunset & sunrise along with the family and friends. Plant new trees & flowers in your garden on this auspicious day, to make the environment in your house peaceful and serene. You may bring a bouquet of felt flowers or spring flowers into your home. You can also renew and refresh your home with some nice essential oils. Let your house blossom with the fragrance of fresh scent on this auspicious day. Any celebration is an apt chance for a feast. Prepare sumptuous mouth-watering dishes with eggs, fresh bread, sprouts, shoot, early spring greens along with wine. Organizing a bonfire is another excellent way to spend good time together with family members. Activities like playing music, dancing and singing can make this day all the more memorable for you. Egg decoration is another way to celebrate the spring equinox. Get some wooden Easter eggs, decorate them and put them on display in your home. Clear up the dirt and clutter from your house on this auspicious day of Spring Equinox. Innovate and start doing something new on this beautiful day. Make it a part of your daily schedule and your life will become blissful. It is said that Julius Caesar originally set 25th March as the date when in around 45 BC, he set up Julian calendar. However, there was a difference between the two equinoxes because the Julian calendar set the year for about 365.25 days. Because of this reason of drifting in the Julian calendar, the decision to establish a modern calendar was taken by the Pope Gregory XIII, and he came up with the solution to create the Gregorian calendar which adhered to the Easter day (Around 21st March) set by the council of Nicaea. Read this now: How Super Full Moon in Libra will Affect Our Lives? However, his efforts were in vain as this calendar was also far from being accurate. Easter would occur on a date before the equinox due to the reason of the oscillation around the mean position by over 50 hours. Soon, this problem was fixed up by the expert astronomers who removed a few days from the calendar, so that the range of days was fixed up for the Spring Equinox from 19th March to 21st March. Over the years, different cultures have been celebrating the day of Spring Equinox for the various rites, festivals, and rituals.